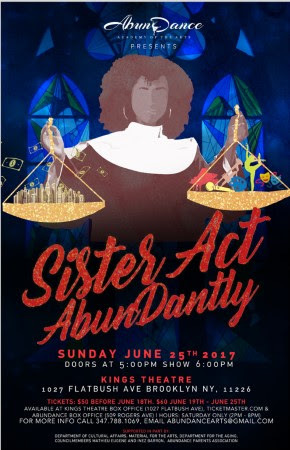 AbunDance Academy of the Arts will present a new work, “Sister Act, AbunDantly!”, a family-friendly theatrical dance performance featuring students and seasoned Broadway artists on the same stage, on Sunday June 25, 2017 at the Kings Theatre in Brooklyn. Inspired by the hit movies “Sister Act” and “Sister Act 2” starring Whoopi Goldberg, “Sister Act, AbunDantly” tells the story of a compassionate and successful Broadway star who returns to her hometown of Brooklyn to inject the arts into every corner of the borough. With over 110 performers ranging from 3 to 83 years old and a cast of Broadway alumni, “Sister Act, AbunDantly!” shows how one person can unite a community through the arts. Featuring a live band and a choir consisting of trained seniors from Brooklyn’s Hazel Brooks and Teresa Moore Senior Center -- made possible by a grant awarded to the academy by the City Council's office and Department of Cultural Affairs -- in addition to younger students, AbunDance Academy of the Arts hopes to show audiences that you are never too old or young to participate in the world of performing arts. “Sister Act, AbunDantly! is a show about the importance of community support to help keep the arts alive and showcases how it can inspire and uplift people. This production is especially relevant at this time when our organization and so many others like us are working diligently through tremendous obstacles to make the arts accessible for communities of all socio-economic backgrounds,” said Karisma Jay, Founder and Artistic Director of the AbunDance Academy of the Arts. The performance helps to raise funds to support AbunDance Academy of the Arts' ongoing commitment to offering top notch instruction to people of all ages, backgrounds and income levels so that they can experience the arts first-hand, and to help the Academy find a new location after being uprooted from its established home in Lefferts Garden. AbunDance Academy of the Arts is an established Brooklyn-based non-profit arts organization dedicated to offering children and adults affordable dance, theater, and musical instruction at all levels. At this point in time, Abundance Academy of the Arts is in the midst of a sudden uprooting from its established home in Lefferts Garden, Brooklyn as another casualty of hyper-gentrification and sudden rising rents. Currently, the academy is teaching its students in temporary locations as it searches for its new home where it hopes to remain and inspire and train students of all ages and socio-economic backgrounds for generations to come.